His Holiness digressed to advise monks and nuns sitting before him that when the sun got too hot they should cover their heads with their upper robes. He instructed lay people likewise to put on hats or raise umbrellas. “Those of us gathered here, whether we follow religion or not, whether we count ourselves Buddhist, Muslim, Christian or Hindu, we are first of all human beings. Our religious identity is secondary. We may pray for the welfare of all sentient beings, but in practical terms it is our fellow human beings we can actually do something for. Animals, birds and insects surround us, yet there is little we can do to teach them. Language enables us to share our experience of love and compassion with other people. “All beings, including the 7 billion human beings, want happiness and don’t want suffering. This is a matter of our state of mind. We have five sensory consciousnesses, but it’s the sixth, mental consciousness, that holds the key to pain or joy. We can enjoy watching beautiful and captivating events, listen to moving music, smell pleasing fragrances, taste delicious food or revel in the pleasure of touch, but if we compare these sensory experiences with peace of mind, the mental experience is stronger and more lasting. His Holiness discussed how theistic religions believe in a creator God and consider such a God to be filled with infinite love and mercy. Non-theistic traditions like one branch of the Samkhyas, the Jains and Buddhists consider the source of happiness to be in our own hands. This is why the Buddha stated that the Buddhas do not wash unwholesome deeds away with water, nor do they remove the sufferings of beings with their hands, neither do they transplant their own realization into others. It is through teaching the truth of suchness that they liberate (beings). “As a follower of the Buddha, belonging to the Nalanda Tradtion,” His Holiness continued, “someone who has undertaken study, contemplation and reflection, I feel we should have a concern for all human beings, since we all seek happiness. In addition, we should promote harmony among our religious traditions, which are a source of human benefit, despite adopting different philosophical positions. After all, there are differences of stance between the Middle Way and Mind Only schools within the Nalanda Tradition, but they aren’t grounds for fighting or quarrelling. In the end all these traditions commend the practice of love and compassion. His Holiness asked the school-children in the audience if they preferred to see people laughing together or quarrelling and running away from each other. He then remarked that although there are some people, who, seeing a fight, want to join in, by and large seeing other people happy makes us happy too. He noted that we human beings are social animals for whom friendship is a condition of happiness. But to make friends requires trust. Compassion predisposes us to avoid being dishonest and deceiving others—a fundamental component of trust. His Holiness also observed that in relation to achieving happiness, material development alone is not enough. Inner values like love and compassion are crucial too. These are related to methods for transforming the mind that have grown from the common Indian practices of shamatha, cultivating a calmly abiding mind, and vipashyana, which involves developing wisdom and insight. In response to His Holiness’s request, members of the audience held up copies of the texts he was going to teach, which had been made available in Tibetan, English and Chinese. He clarified that the first, ‘In Praise of Dependent Arising’, praised the Buddha not for his physical qualities, but for his having taught dependent arising. He mentioned that in his first series of teachings, dealing with the Four Noble Truths and so forth, he introduced that concept of causality as illustrated by the twelve links of dependent arising. These start with ignorance and end with aging and death. Ignorance enmeshes us in unenlightened existence, but to overcome it leads to liberation. Nevertheless, he eventually taught the Four Noble Truths and the Vinaya that are common to all traditions of Buddhism. Later, on Vulture’s Peak he elaborated on the impermanence, nature of suffering, selflessness and emptiness of these truths and how they are conducive to cessation and the path to it. In his analysis he revealed that while it may be clear that effects depend on their causes, causes are also dependent on their effects—they are interdependent. To answer what is the purpose of looking for the reality of things, Nagarjuna observed, “Through the elimination of karma and mental afflictions there is liberation; karma and mental afflictions come from conceptual thoughts and these come from mental fabrications. Fabrication ceases through emptiness.” The point being to eliminate distorted views that give rise to disturbing emotions. When Nagarjuna’s Middle Way School of Thought asserts that things do not exist truly, it means they do not exist as they appear, that is as intrinsically existent. ‘In Praise of Dependent Arising’ begins by lauding the Buddha as an unparalleled teacher because of his instructions about dependent arising—that things are not independent but exist merely as designated. In the course of reading through the verses, His Holiness recommended that if his listeners found them interesting they should also read Nagarjuna’s ‘Fundamental Wisdom of the Middle Way’ and his ‘Precious Garland’. A little further on he also recommended Bhavaviveka’s ‘Lamp of Wisdom’ and ‘Blaze of Reasoning’, besides Chandrakirti’s ‘Clear Words’. After glossing both ‘In Praise of Dependent Arising’ and the ‘Eight Verses of Mind Training’, His Holiness led the assembly in the ‘All-encompassing Yoga’, which introduces an experience of altruism and emptiness. The aggregates are not in him, nor is he in the aggregates. The Tathagata does not possess the aggregates. His Holiness mentioned that realization of emptiness contributes to the accumulation of wisdom and cultivating altruism contributes to the accumulation of merit. Since these ultimately result in the two bodies of a Buddha, it’s important to reflect on them daily. Acknowledging that, although the texts he’d been dealing with were Buddhist, there were both Muslims and Buddhists in the audience, His Holiness concluded that altruism would benefit them all. 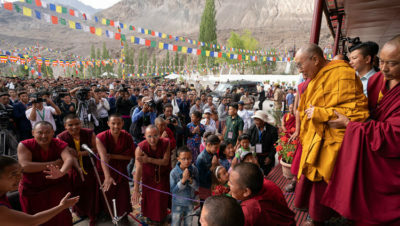 The local president of the Ladakh Buddhist Association offered words of thanks, expressed the hope that His Holiness would return to Nubra again and again and prayed that he live long. Representatives of Muslim communities in Turtuk, Bogdang and Nubra joined His Holiness for lunch in a marquee beside Diskit Phodrang. Afterwards, back at the teaching ground, he addressed them, recalling the excellent relations that had persisted between Tibetans and the Muslims who had settled in Lhasa during the time of the Fifth Dalai Lama. He repeated his appreciation that members of that community, now resettled in Srinagar, keep up their exquisite command of Central Tibetan dialect, which they continue to pass on to their children. His Holiness mentioned that recently in Leh representatives of the Sunni and Shia branches of Islam had come to see him. He had suggested to them that since India has a longstanding tradition of inter-religious harmony and since there have been no reports of strife between Sunnis and Shias in this country, Indian Muslims might join together to convene an international conference of Muslim leaders to examine how to mollify such quarrels elsewhere in the world. On his way back to Diskit Monastery, His Holiness visited the newly established Diskit Jama Masjid where he stood in prayer. Seated outside, various Muslim elders and leaders expressed appreciation of His Holiness’s role in the world. It was observed that he had been given awards such as the Nobel Peace Prize not for preaching about Buddhism, but for his veneration of all religious traditions and his work to promote harmony among them and peace in the world. 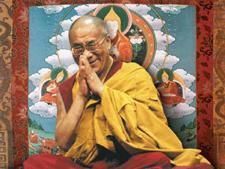 People make mistakes, but leaders like His Holiness influence people everywhere for the better. “Thank you for inviting me here,” he responded. “You should know that today the whole world is interdependent. In the past countries may have lived in isolation, but now from a global economic point of view we are mutually dependent. “In terms of climate change and global warming, we are all affected. We are likely to see a consequent increase in natural disasters, therefore we must cultivate a sense of the oneness of humanity. To think only of ourselves in a narrow way will not produce positive results. In past centuries, when we indulged in thoughts of ‘us’ and ‘them’, the result was that we killed each other in war. If, on the other hand, we work together, conscious of the oneness of humanity, we might yet be able to stem the worst effects of climate change. His Holiness informed his audience that following the September 11th event of 2001, whenever he could he has opposed moves to tarnish the reputation of Islam and has defended Muslims, because Islam, like other traditions, primarily conveys a message of love and compassion. He recalled a teacher in Turtuk previously telling him that someone who provokes bloodshed is no longer a proper Muslim and that true Muslims are enjoined to extend kindness to all creatures of Allah. After mentioning his admiration for Guru Nanak, the founder of Sikhism’s pilgrimage to Mecca, His Holiness expressed his own happiness to have been able to don a white cap as a mark of respect and make this pilgrimage to the Diskit Mosque.